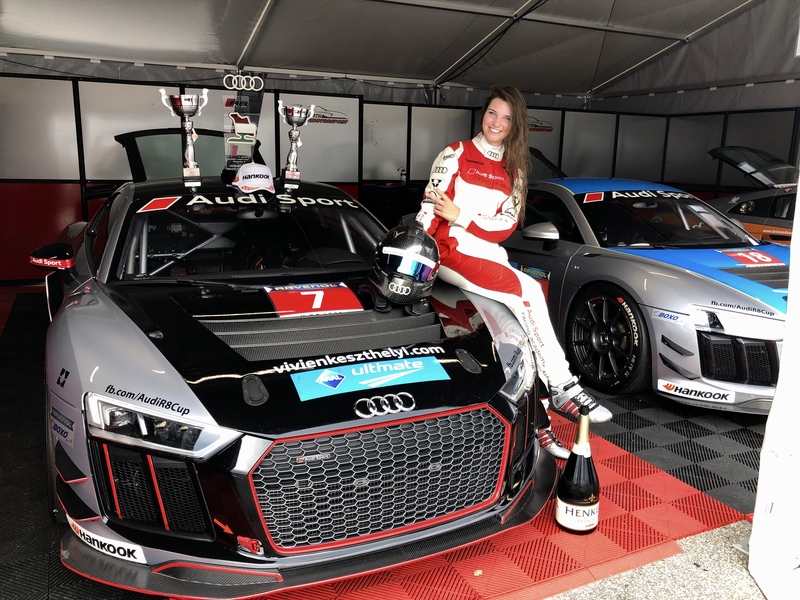 Vivien Keszthelyi achieved one of the biggest successes of her career so far at Hungaroring, as the world’s youngest female GT-driver finished 2nd at the second race of Audi Sport Seyffarth R8 LMS Cup’s third race weekend. The 17 year old Hungarian member of Audi Sport Racing Academy had some technical issues and had to face unsteady weather conditions, too, therefore she set just the 6th fastest time at the first qualifying in front of the home crowd at Mogyoród. On the first race, she did a good job, and despite the problems she managed to catch the fourth place. She was extra motivated before the second qualifying and made a fantastic lap, the overall cup leader, Kris Heidorn was the only one having been faster.. Vivien had a good start, and although some of her rivals tried to beat her in the first couple of laps, she defended very well and increased her advantage finishing the race on 2nd place. Now, there will be a two months break in the cup series, which continues in August in Great Britain, Brands Hatch.